Today is the day we find out the NEW floral fragrances for Spring 2011. Me and my fabulous team get to read the surveys filled out by our hard working/testing S.O.A.P. team. Thank you for all of your hard work ladies! Click on the links below to check out all of their fabulous blogs. I love my job! 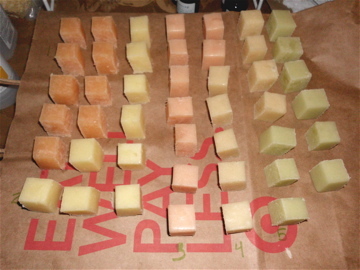 Holly with Lotion Bar Cafe: Holly tested the fragrances in candles, bath fizzies, room spritzers, lotion, lotion bars, melt and pour AND cold process. Wowza. Thanks for covering it all, Holly! Ruth with Sirona Springs Handmade Soap: Ruth tested in cold process and she went over the top with her designs. We were impressed with her individual designs for each batch of soap. 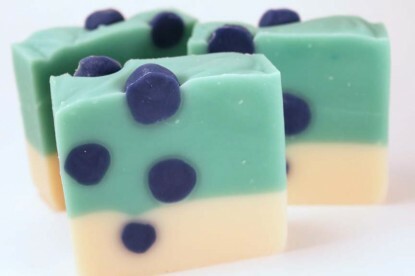 Ann with Pitter Patter designs: Ann also tested in cold process, lotion bars and bath fizzies. She had great photos and comparisons of the discolorations. Side note: Ann has a delicious looking Peanut Butter Cupcake recipe on her blog. I can see that cupcake in my near future. And, she makes the CUTEST burp clothes and baby schwag in her Etsy shop. Erica with The Bonnie Bath Co.: Erica tested in lotion and melt and pour. She even did a contest on her blog to win all of the lotion samples (great idea). I wonder who the lucky winner was? Catherine with Catie Beth: Catherine had the help from her crafty husband to create a special mold to test the gardenia fragrances in cold process. Everyone needs a crafty husband! I’ve got one and even made a list of why crafty husbands make the best husbands (even back in 2007, I knew I had a gem!). 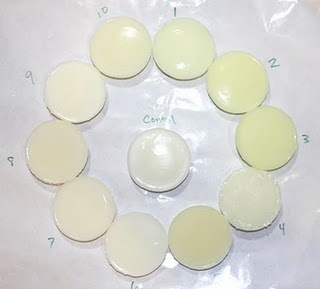 Excellent gel phase example on the left. 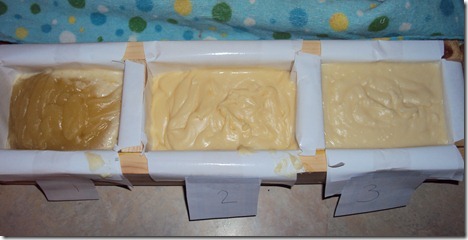 Amber with Addicted to Crafting: Amber tested in sugar scrub cubes, melt and pour and had great notes on discoloration and and first impressions. Didn’t her sugar scrubs turn out cute? My new favorite word is, “adorb” and these definitely fit with that word. Meghan with Dreaming Tree Soapworks: We loved her initial fragrances notes and can’t wait to read the survey for more of her testing notes. Thanks again, S.O.A.P. team, for taking the panel testing so seriously. You are all rock stars! 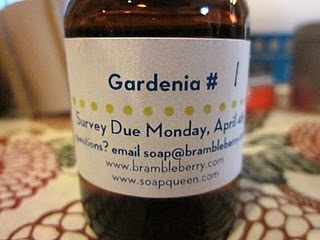 Off to read the surveys with the BB team and decide on some new Spring fragrances. Stay tuned! Thanks for including me. It was a pleasure. I did write several times in the weeks leading up to the deadline, but Courtney said she was unable to email me the survey for some reason. I hope my blog was enough. I was also out of town and couldn’t show off my bath bombs made with these scents, but I’ll still reveal now that I am home. Thanks also for the extra goodies. It was a nice surprise I will put to good use. The blog did help, thank you so much! We loved reading your testing notes. I’m not sure what happened with that email address. We had several people try to email it from the office to no avail. Did you check your spam folder? Someone else has been trying to contact me and has not been able to get through. I do have a spam holder I check daily in outlook, but I’m going to have to go online and see if there is another one somewhere. At least I was of some hlep. I love the ones you guys picked to stock. I wanted to say thank you for picking me. 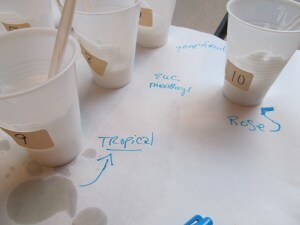 It was so fun to try the fragrances out in different applications and how they changed depending on what the medium was. The sugar scrubs were such a big hit that I am all out of them! Thank YOU for doing such a great job. We appreciate having the help of the SOAP team so much! Thank You for letting us do this , it was so much fun!!! Can not wait to see what the scents are! I want to be as talented as these ladies when I grow up. 😉 Mmmm, I can smell the scents from here through the screen! LOL! Teresa, Pshhh-aw! You already are, silly girl. =) But it’s definitely good to spread the love and compliments far and wide. That’s an interesting take on it Ruth. And what a good attitude you have about it. We LOVED LOVED LOVED your soap and all the different techniques you used. It was so much fun to see your batches. Thank you for participating. I had so much fun doing this. I am absolutely jumping out of my seat in anticipation. I can’t wait for you to reveal the identities of the fragrances. I know them so well now, I know I am going to laugh when I find out what they are truly called! 🙂 Thanks again for including me. Thank you so much for your help and your awesomeness. And can I just say again how much I love my adorable bump clothes? Thank you, thank you, thank you! =) We’ll reveal soon … I promise! Thanks for the shout out! I was so bummed that I couldn’t finish testing with CP soap. I had to switch to M & P due to walking pneumonia. 🙁 It was so much fun, though! Can’t wait to find out the results! Walking pneumonia is no joke so definitely glad that you took care of yourself and took it “easy” with testing in MP. That is a-okay with us. We’re just thrilled that you joined our S.O.A.P. panel! =) Thank you!